Corruption has played a pivotal role in sustaining appallingly high levels of poverty in many developing countries, particularly in relation to the deficient provision of basic services such as education and healthcare. Corruption drives the overexploitation of natural resources, capturing their value for the elite who benefit. In the developed world, corrupt funding undermines political systems and lays policy open to heavy financial lobbying. 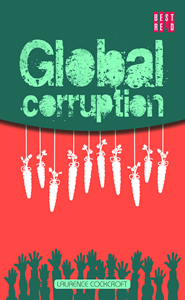 Global Corruption attempts to identify the main drivers of corruption worldwide and analyses the current efforts to control them. This compelling book suggests ways in which the problems caused by corruption can be addressed and ultimately prevented. The author draws on years of experience and knowledge and makes this book an accessible, informative and thought-provoking guide to corruption operating at all levels of society. Laurence Cockcroft is a development economist and has been interested and committed to development in Africa since his first experience in Nigeria as a volunteer with VSO International in 1962. Following a study of history and economics at Cambridge University he was awarded a fellowship by the London based Overseas Development Institute to work in the Ministry of Rural Development in Zambia in 1966. He extended this experience of working closely with small-scale farmers to Tanzania where he was employed by the Tanzania Rural Development Bank. He authored Africa's Way: A journey from the past in 1989. During the 90s he became co-founder and member of Transparency International serving as Chairman from 2000–2008, In these roles he has been particularly active in assisting with the development of chapters in Africa, in launching Transparency International’s Business Principles for Countering Bribery, in launching pioneering work on corruption in the global arms trade, and in promoting the wholesale revision of the UK's anti-bribery laws, leading to the Bribery Act of 2010 – the first to outlaw bribes paid abroad. The Long March: Is There Progress?